Biochar is not a fertilizer, but rather a nutrient carrier and a habitat for microorganisms. First of all, biochar needs to be charged to become biologically active in order to efficiently utilize its soil-enhancing properties. There are numerous methods of activating and producing substrates similar to terra preta aside from mixing biochar with compost. 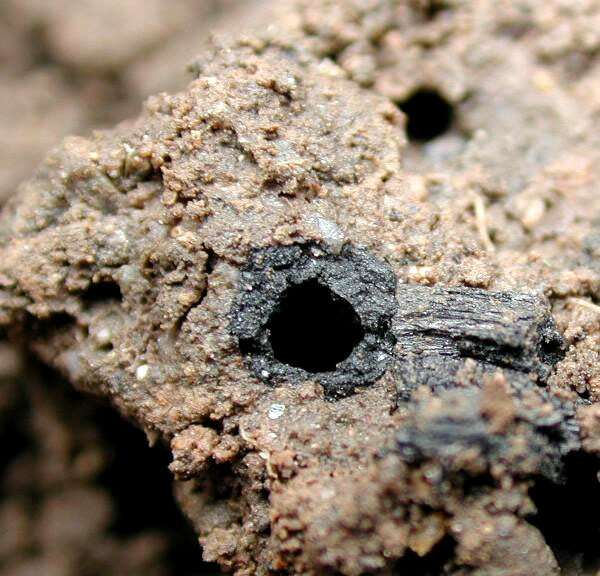 Biochar is extremely porous and has a huge surface area of 300 m2 per gram. Due to its high porosity, biochar can incorporate up to five times its own weight in water and dissolved nutrients. This property is called adsorption capacity (AC) and depends on the pyrolyzed biomass and the pyrolysis temperature. The highest adsorption capacity of biochar is achieved within the temperature range of 450 ° C to 700 ° C.
Another important feature regarding the particular nutrient dynamics of biochar is its high cation exchange capacity (CEC). The CEC is a measure of the ability to bind positively charged ions (cations) on biochar’s surface and make them available later, under appropriate conditions, to plants and microorganisms. 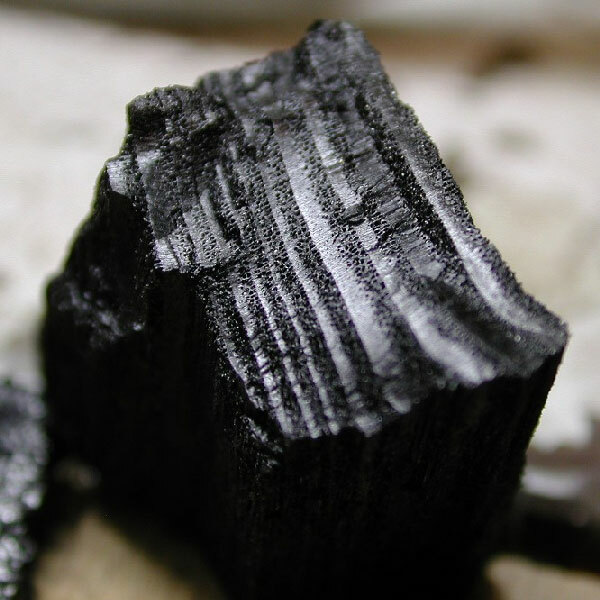 While CEC depends on the surface of biochar, it is also a chemical value, which increases through oxygen and contact with the soil and reaches its maximum value only after some time. A high CEC prevents the leaching of mineral nutrients, such as organic nutrients, and assures high nutrient availability. Further, a high CEC also binds toxic molecules, thereby protecting the soil. The combination of biochar’s high AC and CEC make it a perfect nutrient carrier. Microorganisms find ideal habitats in and around the biochar through these absorbed nutrients, which, in turn, benefits the entire soil microbial life and promotes the potential for symbiotic microorganisms and plant roots. Aged by oxidation to bring CEC close to its maximum. The experiment by Andreas Thomsen clearly shows the importance of charging biochar. In the picture, the upper portion shows a series of experiments wherein pure biochar particles were added in increasing dosage. In the lower series of the picture, the biochar was composted first for 4 months and then cleaned of compost to make sure that only the charged biochar in the experiment was used. 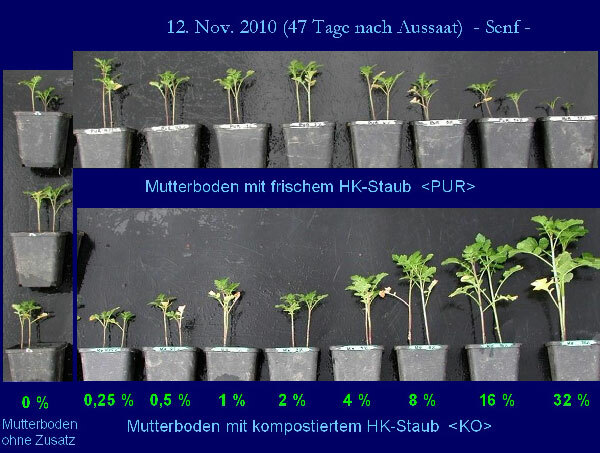 While pure biochar resulted in growth inhibition of mustard plants, charged biochar showed a significant increase in growth (thanks to Andreas Thomsen). The charging of biochar by addition and mixing of compost probably represents the best way to produce terra preta and similar substrates. Microbial stimulation is highest in compost: nutrients are built into complex organic compounds and the final substrate is very close to the soil’s humus. However, most available composts are of poor quality. Poor compost is tediously “digested” in the ground and this leads to nutrient blockage and microbial imbalance. If you are not sure about the quality of your compost, it is better resort to one of the other options for charging the biochar. Good compost must have a crumbly structure, similar to that of humus soil, and is not supposed to smell bad. Ideally, biochar is added to the compost at about 10% of biomass when arranging the pile, to boost the compost’s nutrient efficiency (see Fig.__ below). Frequent “turning” is important for oxygenation and homogenous distribution of nutrients, which, consequently, promotes microorganismal activity. A preliminary experiment at the Delinat Institute has shown that the addition of biochar significantly improved the reaction of the nitrogen compound by stabilizing and significantly increasing plant-availability of nitrate (NO3). Nitrogen loss is slowed down and, with it, the emission of greenhouse gases. In a second, larger experiment, this effect will be verified and investigated in detail. A separate article on the topic of composting with biochar will be published in Ithaka. The biochar produced with compost can be used again after rotting for charging other fresh biochars. Mature composts that have not been composted with biochar can also be used to activate biochar. To activate, stack the biochar in approximately a 1:1 volume ratio with the mature compost and moisten both well. If possible, mix biochar and compost with a compost turner. This process can be repeated several times until the ratio reaches 1:1. The mixture should be prepared at least 2 weeks prior to its application into the soil and during that time should always be kept moist and turned at least twice. A mixture of different manure types is preferable to one type of manure. Attention should be given to a high straw content. Since the following method is not about composting, the manure should be stored at least 1 year prior to use. It is better, however, if the biochar is already used as bedding for the manure in the barn. Alternatively, it is also possible to regularly spread the biochar in the septic tank. Moisten the biochar with plenty of water. Spread out the biochar into strips/bands of about 120 cm width and a height of about 5 cm on a humus-rich soil, when possible. Spread over it a 3 cm thick layer of manure. Put 1% rock flour into it (not necessary, but it improves the quality of the substrate). 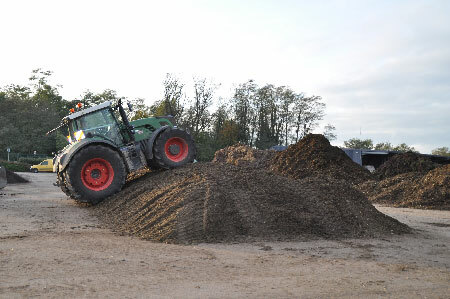 If the manure to be mixed is not high in straw content, put layers of about 10% grass, corn silage or greenwaste into it. Spread over it another layer of biochar. Moisten the whole with as much water as possible (if possible, put compost tea or EM-A [Effective Microorganisms]). If the ground in which the mixture will be used is too firm and less productive, a layer of fresh, fertile, soil should be added for microbial colonization of the substrate to take place. Roll over the band with a rotovator at least twice to thoroughly mix the substrate. Keep the mixture well moisturized for 14 days and stir it every 3 days with the rotovator. It is recommended to cover it with fleece. Activating biochar through Method 2 in the winery Pago Casa Gran, southern Spain. Calculate the amount of fertilizer you need for a given area. Mixing with biochar reduces leaching and outgassing of nutrients, so that fertilizer efficiency increases significantly and a total of only half of the conventionally calculated amount is required. Make sure that the fertilizer contains not only the main elements (N, P, K, and Mg) but also has a very high mineral diversity. In case of doubt, add some rock flour. Dissolve the calculated amount of mineral fertilizer in sufficient water. 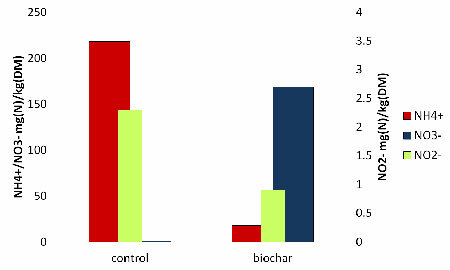 Give as much biochar in a period of 2 days to allow complete absorption of the added liquid. Organic liquid fertilizer is preferable for charging instead of NPK fertilizer. Liquid animal manure is an excellent example to use for charging biochar. Variant C is not about microbial colonization. In this example, colonization will take place in the soil. In organic farming, mineral fertilizer trade is prohibited. Mix straw-rich manure with 10% grass clippings, 10% biochar, and 1% rock flour. Spray the biomass with a solution of 3% EM-A and 3% cane molasses. (Alternatively, instead of EM-A, Sauerkraut [pickled cabbage] juice, Brottrunk [a particular juice manufactured from bread], or juices containing enzymes with similar high amount of lactic acid bacteria can be used. This can prolong the fermentation process depending on the mixture.). Compress the pile by driving on it with a tractor repeatedly as shown above (see picture). Cover the pile with an airtight suction foil. Cover the whole thing with a black foil and load it with gravel bags. (On a smaller scale, this can be carried out in closed containers such as buckets, barrels, or plastic bags.). Remove the foil after 14 – 21 days, depending on ambient temperature. The product will smell slightly like lactic acid! To activate a larger amount of biochar, the Bokashi can be filled up to 50% (vol) of biochar. For terra preta similar substrates, this additional amount of coal is not necessary. Water and mix the pile with a compost turner or rotovator and let it aerate for several days. To inoculate it with soil-borne micro-organisms, add some fresh soil. The activated biochar and terra preta similar substrates should be incorporated superficially in the soil. If the appropriate technology is not available, the substrate may simply be spread on the ground. The anxious mixing by worms in the soil takes a little longer. This entry was posted on Saturday, March 19th, 2011 at 12, Mar and is filed under climate-farming. obiger Bericht beschreibt eine Arbeitsweise gegen einen gesunden, lebendigen Humusboden. In ihrem Beitrag von Niggli + Kinzer “Wie Pestizide + Dünger das biologische Gleichgewicht stören” ist unter Anderem sehr richtig über Mineraldünger zu lesen, wie Bakterien durch Düngesalze verbrannt werden. nachhaltiger. Sie haben doch selbst schon viel berichtet. Bitte noch mehr im natürlichen Kreislauf denken + handeln. Bei den im Artikel dargestellten Methoden handelt es sich um vier verschiedene Möglichkeiten, Biokohle zu aktivieren. Durch aktivierte Biokohle lässt sich der Humusaufbau beschleunigen, doch führt auch aktivierte Biokohle allein noch nicht zu belebten Böden. Dazu braucht es Anbaustrategien, über die wir in anderen Artikel ja schon öfters geschrieben haben. Dass die aerobe Kompostierung die von uns bevorzugte Methode ist, haben wir in dem entsprechenden Absatz ja herausgestrichen, aber es ist nicht die einzige Möglichkeit. Je nach Einsatzziel, vorhandenen Geräten und Kulturform eignet sich die eine oder andere Möglichkeit mehr. Bei der Bokashierung handelt es sich um einen aneroben Gärungsprozess – die Überfahrt mit dem Traktor dient dazu, den Sauerstoffgehalt in der Miete zu veringern und damit die Milchsäuregärung zu fördern. Es ist eine erprobte Methode, die übrigens sehr erfolgreich für Humusaufbaustrategien verwendet wird. Wenn Biokohle mit Mineralsalzen aufgeladen wird, so verlieren diese ihre entwässernde Wirkung auf die Bodenlebewesen, da sie nicht mehr in direkten Kontakt mit den Salzen kommen. Der Hauptsinn aber ist, dass die Düngemittel um etwa 50% reduziert werden können und sich die Lachgasemissionen um etwa 60% reduzieren lassen. Über 90% der Landwirtschaft ist konventionell und setzt große Mengen an Mineraldüngern ein. Dass all diese Landwirte in den nächsten 5 Jahren zu biologisch arbeitenden Landwirten werden, halte ich trotz all meines Optimismus für nahezu ausgeschlossen. Aber dass sie die Düngemittel und Pestizide um die Hälfte reduzieren, halte ich für durchaus möglich. Und aktivierte Biokohle ist eine Möglichkeit auf dem Weg dahin. Ein sehr interessanter Artikel. Wir haben hier auf den Philippinen gerade ein großes Mais-Experiment gestartet. Das werden wir in den nächsten Tagen um die genannten Methoden A, B und C erweitern. Besonders verblüfft war ich über den Topfversuch von Andreas Thomsen. Bislang haben wir mit erheblich niedrigeren Holzkohleanteilen gearbeitet. Das werden wir auch antesten. Da die Kunstdüngerpreise irgendwie mit den Ölpreisen korrelieren haben alle Techniken zur Einsparung ein großes Potenzial, vor allem in der Dritten Welt. Bei Reis und Mais liegt der Kunstdüngeranteil bei ca. 70% der gesamten Produktionskosten. Das milchsaure Bokashi wird in den Boden eingegraben und im Prizip anaerob weiterverarbeitet. Die Zeiten klingen sehr interessant, müssen aber durch eigene Versuche noch bestätigt werden. Wenn man die milchsaure Fermentierung und die anaerobe Verarbeitung UNTER der Erde und Holzkohle kombiniert, könnte sich eine interessante Variante ergeben. pünklich zum Saisonauftakt kommt dieser hochinteressante Bericht. Meine Kompostexperimente wurden im letzten Jahr von den angrenzenden Freizeitgärtnern neugierig verfolgt und ich habe gerne und lange über aktivierte Biokohle und Terra Preta am Zaun referiert. Jetzt wollen einige Kleingärtner mit meinem TP-Kompost (Biokohleanteil ca. 3%)in ihren Gärten experimentieren. Mit diesem Bericht und vor allem mit dem dokumentierten Versuchsergebnis von Andreas Thomsen habt Ihr mir und sicherlich vielen anderen unwiderlegbare Beweise für das Funktionieren der Biokohle an die Hand gegeben. Dafür herzlichen Dank und weiterhin viel Erfolg. danke für diese wunderbare Arbeit! In México haben wir seit einigen Jahren identische Erfahrungen mit biochar-bokashi gemacht mit Ertragssteigerungen über 50% auf biologisch geführten, eh schon hochgradig verbesserten Böden – die Auswertung ist schwierig, da zu viele Faktoren zusammenfliessen. Welche Form der Energetisierung / Aktivierung die wirtschaftlichste und wirksamste ist, wollen wir deshalb in ersten Grossversuchen auf homogenen Böden der Cerrados (sauer, versteppt, humoser Oberboden < 1 cm Tiefe) mit jeweils wenigstens 10 Hektar Versuchseinheiten auf insgesamt mehreren hundert Hektar ausprobieren. Im Rahmen der Vital Village e.G. können wir dabei andere Gruppen / Interessenten / Konzepte beteiligen. Wir haben seit 2 Monaten ein großes Folgeexperiment zur Optimierung unserer Erdmischung laufen. Es sind insgesamt 10 Mischungen, wovon 9 Holzkohle, Asche und Tierdung enthalten. Dazu dann Kombinationen mit Sand, Regenwurmhumus, Sägemehl und NPK Kunstdünger. Alle 9 liegen bislang fast gleichauf. Nur die Kontrollpflanzung mit Humuserde und NPK liegt deutlich schlechter. Die Mischungen wurden ca. 4 Wochen vor dem Einpflanzen der Tomatensetzlinge und Mungbean-Samen in die Pflanzsäcke gefüllt. Daraus kann geschlossen werden, dass ohne Holzkohle der NPK-Dünger in dieser Zeit weitgehend ausgewaschen bzw. ausgegast wurde. Nächste Woche beginnt die Ernte und dann wird jeder der 440 Pflanzsäcke wöchentlich auf Erntemengen dokumentiert. D.h. in ca. 5-7 Wochen haben wir für die Tomaten ein endgültiges Ergebnis, bei den Bohnen schon in ca. 2 Wochen. 2 Wochen fermentierte Abfälle mit Biokohle wurden in ein Loch in die Erde eingegraben und nach 4 Wochen wieder ausgegraben. Wunderbare Erde. Es sind nur einige wenige Reste (Haut von Bananan) übrig. Das anaerobe Weiterverarbeiten des Bokashi funktioniert. Ein Teil Reis mit 2 Teilen Wasser mischen und gut rühren, danach den Reise entfernen. Das Ganze in ein Gefäß, sodaß noch ca 1/2 – 1/3 der Gefäßhöhe mit Luft gefüllt ist. Danach abdecken, aber es muß noch Luft zirkulieren können (z.B. Zeitunspapier, Küchenrolle,…). Nach ca. 1 Woche setzen sich die Schwebeteile ab und die Flüssigkeit (kann, aber muß nicht) leicht säuerlich riechen. Die Flüssigkeit in ein größeres Gefäß geben und mit bis zu 10 Teilen Milch aufgiessen und vor direkter Sonneneinstrahlung schützen. Die Sorte ist egal, ich verwende Haltbarmilch. Nach ca. 1 Woche riecht es startk säuerlich, das Eiweiß schwimmt oben und die Flüssigkeit ist gelblich (=Milchsäure). In der heißen Jahreszeit kann es scheller gehen. Es werden die “wilden Milchsäurebakterien” eingefangen, die um uns herum überall existieren. Das nächste Experiment wird Bokashi mit Knochen sein. Bin gespannt, wie diese nach 3 – 5 Wochen unter der Erde aussehen, wenn dann noch etwas da ist… . warum nutzen Sie die Pflanzenkohle nicht ausschließlich als das, was sie ist, nämlich, wie Sie ja auch beschreiben, als Kationenaustauscher. Wenn Sie die Kohle dann noch vermahlen und anschließend wieder zu eventuell Pellets mit entsprechenden Hilfsstoffen (vielleicht Kartoffelstärke)zusammenfügen, geht die Umsetzung im Boden durch organische Säuren und Mikroorganismen viel schneller und man erreicht relativ schnell eine Vergrößerung der Oberfläche und damit eine wesentlich erhöhte KAK. Nährstoffe wie Phosphor und Kalium brauchen Sie eigentlich gar nicht zuführen, weil mit Sicherheit ausreichend in ihren Böden vorhanden. Deren Verfügbarkeit kann durch die Pflanzenkohle auch verbessert werden, weil diese, wie Sie auch beschreiben die Aktivität der Mikroorganismen erhöht und damit die Voraussetzung schafft, die organisch und anorganisch fixierten Phosphor- und Kaliumverbindungen zu lösen und pflanzenverfügbar zu machen. Meiner Meinung nach müssen Sie die aufwendige und wenig praxistaugliche “Aktivierung” mit organischen oder anorganischen Düngemitteln nicht ausführen. Wenn Sie beides separat aufdüngen, ist es ökologisch und ökonomisch sinnvoller. Wenn die Pflanzenkohle vermahlen wird, benötigen Sie auch wesentlich weniger, um die gleiche KAK zu erreichen, als mit nicht vermahlener Kohle, vielleicht nur ein Zehntel. Also ich habe jetzt auch kein Konzept, wie man die Pelletierung von Kohlestaub hinbekommt. Aber da gibt es bestimmt Möglichkeiten und auch Fachleute, die das umsetzen können. es scheint allgemein ein großes Problem zu sein, die Einzelkomponenten in angemessener und sauberer Weise zu handeln, d.h. mischen und anwenden. Wir entwickeln deshalb seit einigen Jahren anwendungsfertige, vorgemischte und mit EM-Kulturen versetzte Produkte auf Basis von aktiviertem Kohlestaub. Bei der Anwendung entwickelt sich kein Staub und die Dosierung ist auch einfach. In Deutschland wird es aber wohl noch lange, evtl. zu lange dauern, bis sich in dieser Richtung bei den Landwirten, aber auch bei den Zulassungsbehörden etwas tut, um eine große Wirkung zu hinterlassen..
ich habe mit großem Interesse die Beiträge in dem Forum gelesen. Ich betreibe eine Pyrolyseanlage und suche auf diesem weg Abnehmer für meine Kohlen. Zum einen gibt es eine feine, gemahlene Kohle, die eher als Kohlenstaub zu bezeichnen ist. Zum anderen habe ich eine grobe Kohle, die in Ihrer Stückigkeit eher mit Kornflakes zu vergleichen ist. Im Weiteren suche ich Kooperationspartner um fertige Terra-Preta-Mischungen herzustellen und zu vermarkten. “eine grobe Kohle, die in Ihrer Stückigkeit eher mit Kornflakes” <- wo zu erhalten? -welche Mengen? -zu welchen kosten? Guten Tag liebe TerraForscher und Entwickler, da ich das Buch Terra Preta und einige Webseiten durchstöbert habe, bin ich auch auf der Suche nach einen Holzkohle-Lieferanten. Kompost mache ich schon seit Jahren und unsere Asche (Holzofen) mit einigen Kohleresten kommt immer drauf. Meine Nachbarn sind auch immer ganz neidisch auf meinen Garten. Nur die Anreicherung mit etwas mehr fein gemahlener Holzkohle würde meinem ursprüglich betonharten Boden noch etwas mehr Wasserspeicherkapazität verleihen. Werde nächstes Jahr noch meinen Kräuterpädagogen machen und bin interessiert wie die verschiedenen Kräuter und die Bodengegebenheiten zusammenspielen. Einerseits muss man die Kohle mit Nährstoffen aufladen, zum anderen müssen Hemm- und Giftstoffe, die bei der Verkohlung entstehen, wieder abgebaut werden, damit die Kohle ihre volle Wirkung entfalten kann. Das Aufladen der Kohle ist hier schon bestens beschrieben, deshalb gehe ich nicht weiter darauf ein. Nun zu den Hemm- und Giftstoffen. Je nachdem wie die Kohle hergestellt wurde, enthält sie mehr oder weniger von jenen unerwünschten Stoffen. Je niedriger die Temperatur bei der Pyrolyse/Verkohlung desto mehr PAK(Teeröl) und andere Kohlenwasserstoffe entstehen. Bei 700C° sollten nur sehr wenig PAK anfallen. Soviel ich weiss ist es aber immer noch nachweisbar. Viele dieser Stoffe sing giftig, krebserregend hydrophob/wasserabweisend und zudem biologisch nur schwer abbaubar. PAK ist an die Kohle gebunden und kann von Pflanzen kaum aufgenommen werden. Ich bin mir aber ziemlich sicher, dass die Teerstoffe dafür verantwortlich sind, dass sich die Kohle zwar nach dem Aufladen mit Nährstoffen positiv auf das Pflanzenwachstum auswirkt, aber noch lange nicht die Qualität einer Terra Preta erreicht. Um die volle Wirkung zu erreichen, müssen nämlich die Hemmstoffe für das Edaphon/Bodenleben abgebaut werden, um anschliessend in einem Ton- Humuskomplex verbaut werden zu könen. Die Biologie in einem Komposthaufen ist nur sehr begrenzt in der Lage PAKs abzubauen, da der Kompost die falschen Mikroorganismen für diesen Job enthält und die Zeit nicht ausreicht. Nun gibt es aber einige Spezialisten unter den Pilzen, die dazu in der Lage sind. Nämlich Weißfäuleerreger wie der Austernseitling. Mein Vorschlag wäre nun, Kohle mit Stroh oder Sägespänen zu mischen und ein Weissfäulepilze ans Werk zu lassen. Ich hab diesen Sommer schon so etwas ausprobiert und zwar ein Gemisch aus Sägespänen und Pflanzenkohle in einem Fliessack im Waldboden vergraben. Mit dem Ergebnis, dass er 2 Monate später komplett von rhizomorphen Pilzwurzeln durchwachsen war, vermutlich vom Hallimasch. Ich möchte gerne Terra Preta herstellen. Ich haben diesen Artikel und das Buch mit grossem Interesse gelesen. Ich haben Kompost und Pflanzenkohle zur Verfügung und möchte Sie fragen, welche Mischung Sie mir empfehlen. Ich kann die Kohle beim Ansetzen beimischen oder auch später. Ich habe in einigen Berichten über Terra Preta etwas über die Microorganismen in flüssiger form gelesen, also hier in der Schweiz habe ich diese Produkte noch nicht gesehen. Wo kann ich diese Microorganismen beziehen? Ich habe vor einen Versuch zu starten, da ich Hobby Gärtner bin, Jahrelang habe ich Dünger selbst hergestellt aus Beinwell, Brennnesseln und Wasser, Stinkt unheimlich und der wirkliche Erfolg hat sich nicht eingestellt. Da finden Sie Kontakte und Bezugsquellen. Alternativ kann man auch indigene Mikroorganismen aus der nächsten Umgebung selbst vermehren. Die EBC hat unterdessen hunderte Pflanzenkohle sorgsam untersucht. PAK sind nicht zu unterschätzen und ein wichtiger Parameter für die Kohlequalität. Dioxine hingegen haben wir praktisch noch nie in der Nähe der Grenzwerte gefunden, dafür müsste die zu verkohlende Biomasse Müll mit viel Plastik sein, aber das ist ja über die EBC Positivliste ausgeschlossen. Wer EBC zertifizierte Pflanzenkohle kauft oder sie im Kon-Tiki selbst herstellt und dabei keine Plastik und Autoreifen mit verkohlt, kann bezüglich Dioxine sicher sein. Bei der Verora arbeiten wir schon seit über 20 Jahren mit gezielten Impfungen. Die effektiven Mikroorganismen (EM)eignen sich hervorragend zur Fermentation (Konservierung, Silage) und Verhinderung von Fäulnis in organischem Material. Seit 6 Jahren produzieren wir Nährhumus mit Pflanzenkohle, verschiedene Anbieter verkaufen dies als Terra Preta. Zur Förderung der Verrottung und des Humusaufbaus in der Kompostierung und von eingearbeiteten Gründüngungen impfen wir mit Kompostextrakten und Pfeiffer-Lübke-Kompost-Bodenstarter. Darin sind neben abbauenden Mikroorganismen auch Humusbildner enthalten. Damit konnten mehrere Landwirte ihre Humusgehalte deutlich steigern, sodass Fachleute staunen. Infos über http://www.bionika.ch und http://www.verora.ch. Wie fein muss oder soll die Kohle sein. Beispiel: so fein wie gemahlener Kaffee? Können sie mir diese Frage beantworten? Solang es sich bei der Kohle nicht nur um harte Holzkohlebrocken handelt, sondern eine Mischkohle z.B. aus Strauchschnitt, Ernteresten und auch ein bisschen Holz, muss die Kohle nicht gemahlen werden, das besorgt dann schon der Boden. Grundsätzlich kann man zwar sagen, dass um so feiner, desto besser, aber gerade in Kon-Tiki Kohlen ist eine gute Mischung von feinem und gröberem Material. Der Unterschied zwischen etwas gröber und fein gemahlen ist in der Regel nicht so groß, dass sich die Mühe der feinen Mahlung lohnt. Wir haben sehr gute Resultate mit ungemahlener Kohle. Nehmen Sie im Zweifelsfall lieber etwas mehr und sparen sich die Mühe der Kaffemühle. Wenn Sie die Kohle durch den Gartenhäcksler lassen, kommt eine sehr gute Partikelgröße heraus. Welche ökologischen Vorteile hat Pflanzenkohle im Vergleich zu anderen Ausgangsstoffen (Trockenschlempe, Vinasse,..) in der Düngemittelherstellung? Wie groß sind zum Beispiel die düngewirksamen Parameter oder Schadstoffwerte für Pflanzenkohle? Und wie groß sind die für andere Ausgangsstoffe? Gibt es Vergleiche von einzelnen Ausgangsstoffen? ?